Beginning with the Cadet Sportsman 1 category Saturday, December 29, the Brookville, New York resident posted fifth quick in the morning session. Flexing his muscles and moving his Tony Kart chassis early, Gangi Jr. took over the lead during the eight lap prefinal by lap two and went on to take the race win by 2.272 seconds. The final would be a hard-fought battle, with Gangi Jr. prevailing with a scant 0.077-second victory to start his WKA effort off right. In the Komet Sportsman 1 class, Gangi Jr. would again emerge as the driver to beat. Clocking third quick during qualifying and maintaining that position in the prefinal, the rising star was able to put his skills to the test and sneak away with yet another final victory, this time by a mere 16 thousandths of a second. In his third and final class of the day, Yamaha Sportsman 1, Gangi Jr. would be off to a rather slow start as he only posted seventh fast in qualifying. Turning up the wick during the racing action, the GT7 pilot would move up to fourth in the prefinal and post fast lap in the process. Crossing the stripe first after the 14 lap final race, Gangi Jr. would miss out on the three-peat when he was stripped of his victory due to a post-race technical disqualification that was a non-performance enhancing infraction. Sunday would see Gangi Jr. back on the sacred grounds of the Daytona Speedway for two more classes. In Cadet Sportsman 2, Gangi Jr. posted third place results across the board and another podium result. The Yamaha Sportsman 2 category saw the 11-year-old recover from an 11th place qualifying effort, as Gangi Jr. improved to third in the prefinal and finally second in the final to complete his run with two victories and two more podium finishes. Anthony Gangi Jr. will next head back to sunny Florida, this time for the first rounds of the prestigious and competitive Florida Winter Tour (FWT). 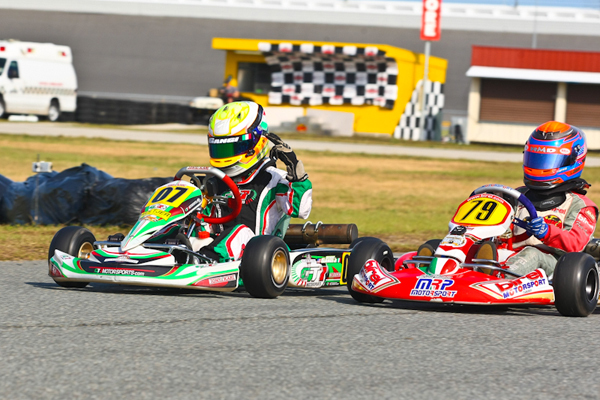 Taking on both the Formula Kart and Rotax rounds during the double weekend event format, Gangi Jr. will be in West Palm Beach, Florida at the Palm Beach International Raceway this weekend, January 12-13, in the TaG Cadet class and January 18-20 for the Rotax Mini Max category. After earning the FWT Rotax Micro Max title back in 2010 and earning third place honors in TaG Cadet last year, Gangi Jr. will be gunning for double championship titles during the popular winter series.